Rosacea: Will It Ever Go Away? What Can I Do? If your face looks like you are blushing and you get bumps that are similar to acne, you might have a skin condition called rosacea. Rosacea is very common. According to the American Academy of Dermatology, 14 million people are living with rosacea. Read on to learn more about rosacea, symptoms, and treatment options. Rosacea is a chronic, inflammatory skin condition that causes redness and visible blood vessels on the cheeks, nose, chin, forehead, or eyelids. It can also produce small, red, bumps with or without pus. Rosacea can be mistaken for an allergic reaction, acne, or other skin problems. Rosacea commonly affects adults ages 30-60. The cause of rosacea has not been determined. WHAT CAUSES SYMPTOMS TO FLARE-UP OR WORSEN? 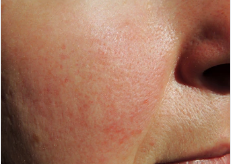 Flare-ups of rosacea often occur in cycles. This means that you will experience symptoms for weeks or months at a time, then symptoms will go away and then return. Flare-ups are caused by everyday things commonly referred to as “triggers:"
Although there is no test to determine if you have rosacea, the doctor will be able to diagnose if you have rosacea by a physical examination of your skin and the description of your symptoms. If you have rosacea, your dermatologist can talk with you about treatment options. While treatment cannot cure rosacea, it can help ease discomfort, reduce signs of rosacea on your skin, and prevent rosacea from worsening. Both lifestyle changes and medications are recommended for treatment. Avoid the triggers that worsen your symptoms. Wash your face with mild, unscented cleansers. Avoid products that contain alcohol, acid, or other ingredients that irritate your skin. Different medications can be used to treat rosacea: Gels, creams, lotions, or pills. Your doctor will determine the appropriate treatment for your situation. If you want to get pregnant, discuss which medications are safe during pregnancy. While there is no cure for rosacea, treatments can control and reduce signs and symptoms. At the Dermatology Center for Skin Health, we offer patients VBeam laser treatments and carry products for patients with rosacea. Our priority is to deliver complete, compassionate care to our patients while educating you regarding the health and beauty of your skin.